*Wait for Rafflecopter to load up right here (if you've gone through RSS feed or are scrolling down the blog and don't see it, click on the actual page title or "a Rafflecopter giveaway link" and it should pop right up). 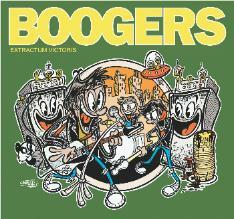 Win 4 Boogers Tickets here--Enter through midnight Thursday 11/29--winner announced Friday. Show is THIS Sunday 12/2 at noon at Beat Kitchen. Hey Chi-town. Come ChiIL Out with ChiIL Mama. We're stoked to be back again as press sponsor for Beat Kitchen's Rockin' Concerts for Kids every Sunday at noon. ChiIL Mama will be at Beat Kitchen this Sunday shooting Chicago's favorite punk parents--The Boogers--at their hotly anticipated Extractum Victoris CD RELEASE PARTY! Come pogo with your punk kin and check out their Ramones style rock. Our friends at Psychobaby will be there with limited edition kids' tee shirts!! ChiIL Mama will also be shooting a video interview with the band and we'll be reviewing the new album and giving away THREE copies to our lucky readers as well. Enter here to win 4 free tickets to any or all of the December concerts & mark your calendars. 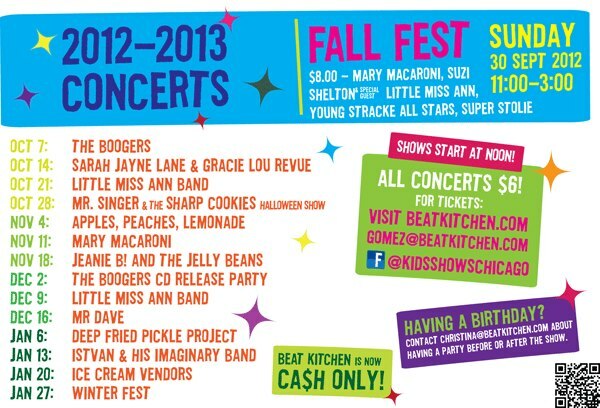 2012-2013 is a great kindie (kids' indie) line up in a wide variety of genres. Enter through midnight each Thursday. We announce our lucky winners every Friday. Shows are generally aimed at birth through 8 year olds and their parents. Kids under 1 are free. *Note: Boogers (playing this Sat 12/2) are LOUD punk and their new album is heavier than ever and recommended for 2nd graders and up. So, bring ear protection for your littles and consider leaving the bitty babies at home for this one! Check out ChiIL Mama like we vote in Chi, IL...early and often for the scoop on upcoming events, urban parenting and loads of original content like HD video show footage, video band interviews, reviews, show stills, ticket and CD give aways and more! Check out ChiIL Mama's plethora of past Boogers coverage HERE including loads of original live concert clips, our video interview and show shots. Advanced tickets are HIGHLY RECOMMENDED for The Boogers CD Release Show. This one will very likely sell out! Of course you can also win 4 free tickets here. We have loads of original content on the kindie music scene including video band interviews, live footage on ChiIL Mama's YouTube Channel, free tickets, and tons of great CD giveaways!! Make it a kindie holiday this year and check out ChiILMama.com like we vote in Chi, IL...early and often. Our giveaways are open nationwide. Tickets are Chicago based. Looking for a particular favorite kids' band or our past Beat Kitchen features. Use the handy search bar in the right hand column to search ChiIL Mama's archives. Good luck and we'll see you out there! Win 4 Little Miss Ann Tickets here. Show is Sunday 12/9 at noon. Win 4 Mr. Dave Tickets here. Show is Sunday 12/16 at noon. *Last BK Kids Show Till 2013! !